The rainfall also shut down lanes near the 710 and 110 interchange. 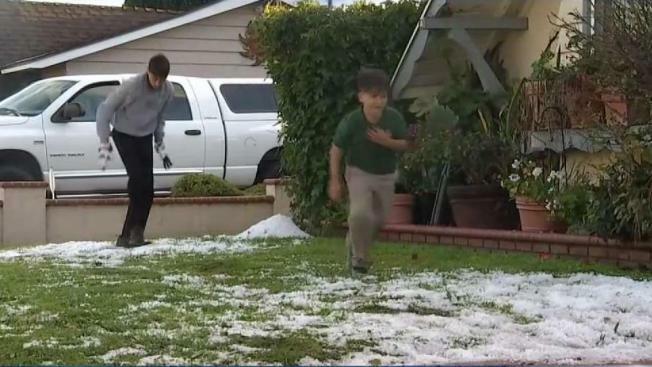 While the rain didn't seem all that impressive in some spots of Southern California, hail sprinkled down on Long Beach, Riverside and Orange County Wednesday, making the first day of spring seem more like winter. NBC4's Shanna Mendiola said rain would be light and off and on from Wednesday through Thursday afternoon, with rain amounts range from a trace to a half inch over the next two days. A winter weather advisory goes into effect at 5 p.m. lasting through 8 p.m. Thursday over the mountains, with up to six inches of snow will fall above 6,000 feet. Amid the sudden rainfall, lanes on the northbound and southbound 710 were closed due to heavy flooding near the 110 interchange. Some of the flooded areas included Compton, Long Beach, West Covina, Whittier, Montebello, and Cerritos. Not only were roads flooded in Long Beach, but hail began dusting roads. Viewers across the region from Placentia to Riverside snapped photos of hail making its noisy debut.